Dioxin Dorms is published by Planet Waves as a service to students and families of students at SUNY New Paltz, and to the movement for environmental justice. This is our mission statement. Cover of July 21, 1994 Woodstock Times with article by Eric Francis. On February 1, 1992, only 35 days after electrical transformers laden with toxic PCBs exploded and burned, sending poisonous fumes through vacant dormitories and classrooms at the State University campus at New Paltz, students were allowed to return to their rooms in Gage Residence Hall. At that time, some parents and students wanted further testing to ensure no danger lingered. Their concerns were dismissed by college and county officials. But it now appears there was good reason to fear for the safety of the students. A sample taken by Woodstock Times from inside a Gage Hall ventilation duct near a kitchen in a student lounge has revealed high levels of polychlorinated biphenyls, the technical name for PCBs, chemicals known to cause cancer, birth defects and genetic damage, and to impair the body's immune and hormone systems. This discovery has led Dr. Ward B. Stone of the state Department of Environmental Conservation, who had the sample analyzed under a state contract, to call for the closure of the building until a comprehensive study determines the extent of the contamination. Gage Hall is scheduled to re-open August 25, when students return to the campus. A sample of wallpaper taken from the same room as the vent also showed high PCB levels, as did a soil sample taken outside Scudder Residence Hall, next to Gage. Sampling was conducted with two witnesses present, including a student who lived in the building, and the process was videotaped. The samples were taken and analyzed without the knowledge of state officials or contractors involved with the clean-up. Neither county health nor SUNY-New Paltz officials returned calls this week requesting comment on the contamination. "It's not anything we would respond to," said William Geary, a spokesman for Clean Harbors Inc., the state's lead environmental contractor in the clean-up of the New Paltz PCB disaster. So far, the state has spent approximately $36 million on a clean-up that is not yet complete. Even though Clean Harbors was not willing to discuss the situation this week, it may eventually have to answer for its actions in court. Earlier this month, Woodstock Times reported that Clean Harbors has been named by the state in a $47 million lawsuit over alleged negligence on the PCB clean-up. The action was the first time the state has acknowledged that students not on campus at the time of the original incident might have been harmed as the result of their subsequent exposure to the toxic chemicals. In the lawsuit that sparked the state's effort to shift potential for blame to Clean Harbors, student plaintiffs have charged that, "Clean-up activities were not conducted in a good and workman-like manner and in accordance with sound and appropriate environmental standards and principles." As a result, "The plaintiffs and their possessions have unduly been exposed to toxic substances." The sample taken by Woodstock Times from inside a vent in a basement lounge was given to Stone, who sent it for analysis to an internationally-known laboratory in Wisconsin. Stone, widely known as a whistle-blower on environmental issues, said the test revealed "very high levels of PCBs" in the vent. "This means that there needs to be additional studies to see how contaminated it is," he said. Stone said this week it is "certainly a possibility" that the health of students in Gage Hall was in jeopardy because of PCBs there. The danger would depend on whether students breathed or otherwise came in contact with the chemicals. "This means [the building] needs further work," said Stone. Stone believes the state has adequate technical resources to do a complete study on Gage Hall in the month prior to its scheduled re-opening. But he also suggests it would be appropriate for all sampling to be observed by impartial parties to ensure the samples are taken honestly. If the tests come back with unacceptably high levels of toxins, then Gage Hall might need to be shut for some time in order to undergo an extensive clean-up similar to the ones undertaken in Bliss and Scudder residence halls, two other dormitories contaminated in the December 1991 incident. Gage was originally scheduled for an extensive clean-up, but at the last minute government officials reversed themselves and opened the building with relatively little testing and clean-up. Dr. Arnold Schecter, a leading expert on PCB and dioxin contamination known for his studies on Agent Orange victims, said of the New Paltz situation, "It would be prudent to shut the building down and do the sampling." 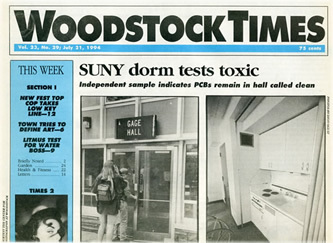 The sampling done by Woodstock Times, the only independent samples taken since the New Paltz disaster, indicates contamination could be widespread on the New Paltz campus. A wallpaper sample taken from the same Gage Hall lounge showed high levels of PCBs even though earlier tests on file with the state show that the wallpaper tested "non-detect" for PCBs right before the lounge was opened to students. Another sample indicates that soil directly outside dormitory windows is contaminated with PCBs. The samples indicated the presence of two of the most toxic forms of PCBs, chlorine-based industrial chemicals which were banned by Congress in 1976 due to the irreversible health and environmental problems they cause. In New Paltz, the chemicals were used as electrical insulation in transformers which were part of the campus electrical system. The federal EPA has compiled a new, 2,000-page report on PCBs and dioxins, a related compound, which concludes that the chemicals are far more hazardous than previously believed. Both PCBs and dioxins, the report says, are damaging to human fetuses at levels far lower than previously suspected. And it concludes that levels of the toxins already in the human body are high enough to cause reproductive disorders in humans. Dr. Ellen Silbergeld of the Environmental Defense Fund, a leading expert on dioxin, warned state health officials in a letter earlier this year that target levels used to reopen a decontaminated dorm were "severely out of date" and needed to be reexamined. Thus, even if the buildings are as clean as state officials claim, which now appears highly unlikely, those levels may still be endangering the future health of students. The discovery of high contamination levels in a Gage Hall ventilation duct is critical because state officials failed to test the air handling systems there and in nearby Capen Residence Hall, which was also contaminated, prior to allowing 560 residents back into the two buildings. Just hours prior to the reopening of Gage Hall on February 1, 1992, Lake Katrine resident George Farrell, whose daughters attended the college, raised the vent issue at a meeting attended by parents, students, health officials, representatives of the clean-up contractors and the college administration. Farrell's remarks concerning the possibility that toxic contamination might still be lodged in air vents that connect the floors of the dormitories raised a high level of concern among parents, who became so agitated that college vice president Barbara Geider threatened to end the meeting if they did not settle down. "They didn't want to hear about vents," Farrell said in a recent interview. At the meeting, Dean Palen, an official of the Ulster County Health Department and now acting county health commissioner, told Farrell that he believed the state's efforts were adequate to ensure the safety of the building, but he neither confirmed nor denied that the vents had been tested. Farrell persisted on the ventilation issue, and takes credit for having pressured Palen into testing the vents in Bliss and Scudder halls, which were found to be contaminated and were later cleaned or replaced at tremendous expense and effort. Vents in Parker Theater and the Coykendall Science Building were also contaminated with PCBs and were cleaned and replaced. Vent contamination is commonplace in PCB blazes, and occurred in notorious PCB fires in Binghamton and San Francisco in the early 1980s. In order to deal with questions from parents and students about the vent issue, college administrators initially denied the existence of vents in the dormitories. But state files included pre-clean-up records of contamination patterns in the building, which indicated that Gage Hall bathrooms and janitors' closets as high as the third floor were contaminated with PCBs. Janitors' closets, bathrooms and lounges are all equipped with ventilation ducts which are believed by state officials to have spread the contamination through Bliss and Scudder halls. Palen, the person responsible for giving final authorization for re-opening contaminated buildings, offered no coherent explanation when asked last August how contamination had reached a janitors' closet on the third floor of Gage Hall if it did not pass through the building's ventilation system: "It may well - I mean -- I - I - I - this-this -- I don't -- I don't - it - it may -- I - I don't really know. And-and again, I don't know how significant that is. It was cleaned up. That's the significant point from a health department perspective." Farrell said that shortly after the explosions and fires, Palen confided in him the suspicion that the utility conduits in the dormitories were also pathways for contamination. Yet while repeated tests of the electrical system in Gage Hall showed evidence of contamination in utility conduits, no testing or remediation was done to the building's 110-volt electrical system in student areas. But extensive electrical work was done in Bliss and Scudder halls. State officials opened several campus buildings under what became known in state jargon as a "Gage-type scenario," in which contaminated portions of the building were supposedly sealed off with plastic and plywood barriers, and students were allowed to live and study in other parts of the building. During winter and summer recesses, clean-up workers would reenter the contaminated areas wearing moon suits and respirators, and continue the testing and clean-up, activities which often involved demolition work, excavation and reconstruction. Additional research on this story was conducted by Jesse Welch, Christopher McGregor, Hilary Lanner, Ian McGowan at Student Leader News Service. Thanks to Carol van Strum, and to Keiko Ito in Tokyo for typing this article in.